The Microeconomics of Complex Economies uses game theory, modeling approaches, formal techniques, and computer simulations to teach useful, accessible approaches to real modern economies. It covers topics of information and innovation, including national and regional systems of innovation; clustered and networked firms; and open-source/open-innovation production and use. Its final chapter on policy perspectives and decisions confirms the value of the toolset. Written so chapters can be used independently, the book includes an introduction to computer simulation and pedagogical supplements. 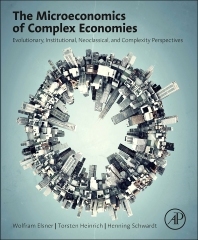 Its formal, accessible treatment of complexity goes beyond the scopes of neoclassical and mainstream economics. The highly interdependent economy of the 21st century demands a reconsideration of economic theories. Advanced undergraduates and graduate students who have taken a first course in microeconomics. 2.6 How Many Games Can We Play? 18.1 What Is Scientific Knowledge? Wolfram Elsner is professor of economics with the Institute for Institutional and Innovation Economics at the University Bremen in Germany. Before working in academia, he spent ten years as a local development official and state-level planner. He has published widely in various journals, has edited several books, and authored three textbooks. He is the managing editor of the Forum for Social Economics and has served as the President of the European Association for Evolutional Political Economy.